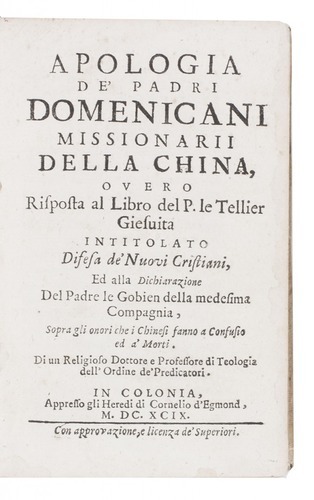 Apologia de' Padri Domenicani missionarii della China, overo rispostra al libro del P. le Tellier Giesuita intitolato Desesa de' nuovi cristiani, ed alla Dichiarazione del Padre Le Gobien della medesima compagnia. Cologne, heirs of Cornelis d'Egmond, 1699. 2 parts in 1 volume. 8vo. Contempary vellum. 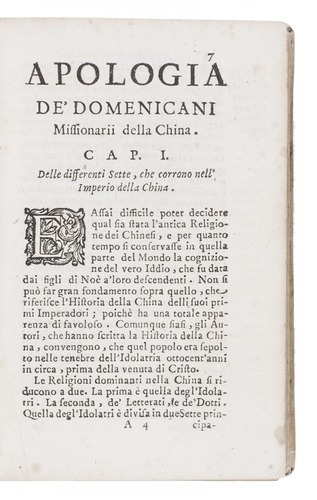 An Italian edition, published in the same year as the French original, of a treatise aimed at the Jesuits Michel le Tellier and Charles le Gobien. The debate between the Dominicans and the Jesuits, known as the Rites Controversy, had arisen over the question whether the Chinese rituals used to honour ancestors and Confucius constituted idolatry. The Jesuits partly adapted to a Chinese lifestyle, and held that converts should be allowed to continue to participate in the rites for Confucius. The Dominican refused any adaptation to local custom and were appalled by the Jesuit practices. The French theologian and church historian Noël Alexandre (1639-1724) joined the Dominicans in 1654 and taught philosophy at the Paris convent Saint-Jacques. According to Weller, the French original edition was printed in Amsterdam. The lay-out of the present edition, however, is rather a-typical for books printed in Amsterdam. De Backer & Sommervogel III, col. 1513; Cordier, Sinica, col. 877; cf. 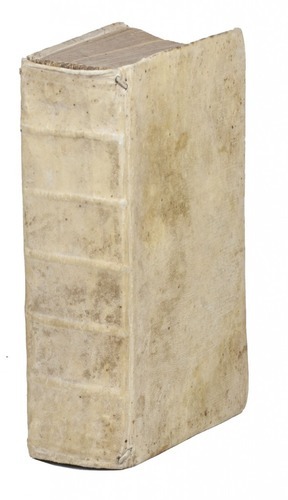 Löwendahl 229 (another edition).